Spring…How do I love thee?…Let me count the ways…. Young leaves bursting in spring, yellow greens………..Hibernating daffodils and tulips emerging, testing the spring breeze………..Azaleas singing in choruses…..Spring breezes……Gentle and thunderous spring rains……Spring fairs…….Neighbors walking……Longer days……Birds singing and playing. Spring is the season for Georgia Tech student entrepreneurs as they bring their ideas and companies into two showcases and competitions: Business Plan Competition and Ideas 2 Serve Competition. Undergraduate, MBA, and graduate students from across campus seed their ideas, creativity, and passion by figuring out how to transform the ideas into reality. All of the ideas have names, logos and teams. Some ideas and their plans still exist on paper, others have prototypes, still others have beta test sites. In the business plan competition, there are full business plans, complete with financials, and 15-minute presentations. The Idea 2 Serve Competition challenges the students to develop unique solutions that serve others. These teams create a 1-minute video, a two-page summary plan and present their ideas to the community at a showcase event. 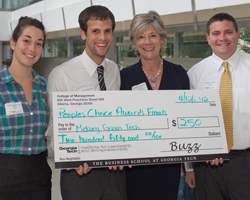 The best teams move on to the finals, where the teams give a 3-minute presentation to an auditorium packed room where the audience, mostly students, votes for their favorite in the “People’s Choice Award”. Oh yes, each year, community participation and support grows. I’m not I’m not sure of the exact count over all of the events, competitions, showcases and teams, but I imagine the total count of mentor and judges is close to 200. Amazing!! If you are not inspired yet – check out the teams and the ideas. The winner of the Business Plan Competition, MAID, is an undergraduate team which created a magnetic assisted intubation device. The 2nd place winner, TUNGO, developed a tongue-guided wheel chair, and the 3rd place team was Mekong Green Tech – which also won the Ideas 2 Serve competition. Their technology helps solve pollution problems related to brick-making techniques in rural Vietnam through the use of simple, low-cost gasifiers. They have test sites in Vietnam – as I write, 3 of the students are in Vietnam working with the villages and their technology. Check-out the website links. I promise, you will be inspired by all ofthe students’ creativity and impact. And, of course – Smile – it’s spring. Whether it is one beautiful spring flower, a tingling song from a bird, or a student believing in their capacity to impact others – remember the Power of One. Celebrate your gifts, nurture your creativity and be bold taking you to the world!